Admired for their high endurance and adaptive nature, Black Bears live a slow-paced life, thriving in the High Sierra wilderness. While "tolerant" of humans, we are "fascinated" with them. Bear stories are a favorite topic of conversation in the neighborhoods where they raid trash bins, show up for barbecues, and occasionally enter homes if they smell a hot apple pie fresh out of the oven. So agile, they can be seen walking along fences and deck railings following an enticing odor. When they meet humans in their path, they'll either ignore them or do a "bluff" charge. However, they are unpredictable and must be given an escape route if encountered. A fed bear is a dead bear and locals know that by feeding them they would quickly become so much of a nuisance they may need to be destroyed. Many take extra precautions by putting smelly refuse in their freezer until garbage collection day. Though it is fashionable to build elevated wooden trash sheds, they are by no means a deterrent to a Black Bear. Black Bears can travel hundreds of miles for food at speeds of 30 miles per hour. Males will dominate a piece of land up to 20 square miles and will kill other male intruders. Though primarily vegetarian, they do eat fish, small mammals, birds, and sometimes baby deer or meat of an animal killed by another. Berries are a favorite delicacy, which they can pluck off the bush with their mouth, one by one. 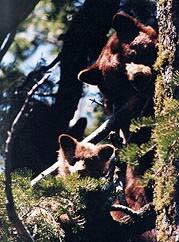 From June to September, up to 30 bears can be found on a one mile stretch of river. During salmon season, they will forget their territorial boundaries since there is plenty of food for all. They grab the fish with their claws, catching 1 out of 7 tries. Picky eaters, they choose the best portions and leave the rest for the birds. Black Bears can weigh up to 600 pounds. During the summer months they gain an extra 100 pounds and a 4 inch layer of fat. Pregnant bears hibernate in hollow tree logs and occasionally under (or in) cabins closed up for the winter. Sows live to be 20 and give birth to up to 10 cubs during their lifetime. They can easily be disturbed during hibernation since their body temperature only drops a few degrees. They don't urinate or defecate, but recycle their waste due to a biochemistry change. In spring they wake sluggish and weak, having lost 25% of their body fat (not having eaten in 5 months). Cubs are born in January: helpless, blind, and hairless, and nurse for 10 weeks in the den. Their eyes open after 6 weeks and they become self-sufficient after 7 months, but stay with mom for 2 years, when they either leave (of their own free will) or are "kicked out".